Background: In Asia, an estimated one million deaths are caused by communityacquired pneumonia (CAP) each year. Despite the high mortality in elderly people, a large number of CAP patients have been treated and survived with optimal life expectancy. A few studies have been done on adult CAP therapeutic approaches in Asia. Moreover, differences have been noted between these studies and European data. We aimed to investigate the efficacy of oral Levofloxacin (TAVANEX), 750 mg, once daily for five days versus parenteral Ceftriaxone 1gr BD, plus oral Azithromycin (250 mg, once daily) for seven to ten days (standard regimen) in CAP treatment. Materials and Methods: We conducted a prospective randomized trial among 150 patients with CAP in Qaem Hospital of Alborz city from December 2016 to June 2017. A group of CAP patients were randomized in two treatment groups. One group was treated with oral Levofloxacin (TAVANEX), 750 mg, once daily for five days and the other group with parenteral Ceftriaxone 1gr BD plus oral Azithromycin (250 mg, once daily) for seven to ten days (standard regimen). The efficacy and side effects of the assigned drugs were compared between two groups. The probability level for statistical significance was set at P ≤ 0.05. Results: The body temperature (P value=0.09), WBC count (P value=0.15), respiratory sounds (P value=0.18) and admission duration (P value=0.15) showed no significant differences after treatment between two groups. There was no report of hospital mortality, clinical deterioration and antibiotic escalation during hospital admission in both groups of study. 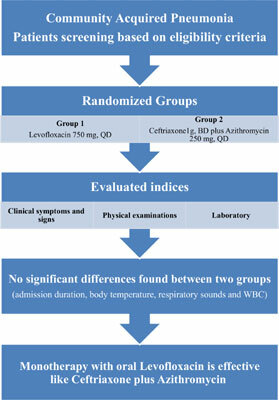 In standard regimen group, only two (2.7%) patients had skin rash while in Levofloxacin group one case (1.3%) had skin rash, two patients (2.7%) had gastrointestinal problems and three (4%) patients showed central nervous system (CNS) complications. In both groups, the reticulonodular pattern was more frequently observed in Chest X-ray. Although standard regimen group (n=27, 36%) showed more consolidation than patients in Levofloxacin group (n=22, 29.3%), and the ground glass pattern was observed more in Levofloxacin group. Conclusion: We concluded that monotherapy with oral Levofloxacin was as effective as treatment with Ceftriaxone plus Azithromycin combination in patients with CAP who required hospitalization. Community acquired pneumonia, levofloxacin, standard regimen, viruses, respiratory infection, fluoroquinolone.